WAREHAM, Mass. — Southcoast Health announced today that the Tobey Hospital Guild has fulfilled its $300,000 pledge towards the renovations and expansion of the Tobey Hospital emergency department. “We are very proud to present this final payment of our five-year pledge to Southcoast Health in just three years. This payment of $93,438 and those before, represents the hard work of many Tobey Guild members. 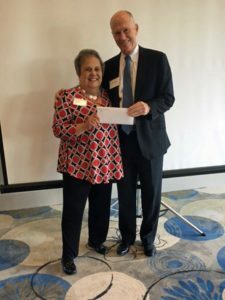 We are proud to support Southcoast Health in this vital update to the Tobey emergency department,” said out-going Guild President Elaine Meredith, at the Annual Meeting held this past Friday at the Rosebrook Event Center in Wareham. The Tobey Hospital Guild is a non-profit organization whose purpose is to render service to Tobey Hospital, its tax-exempt subsidiaries, its patients and to assist in promoting the health and welfare of the community. The Guild raises money throughout the year by hosting fundraisers. Joining the Guild is a great way to become involved in your community hospital. Members serve as ambassadors to the community on behalf of the hospital and Southcoast Health. For more information or to join, please call Sandy at 508-291-1643.